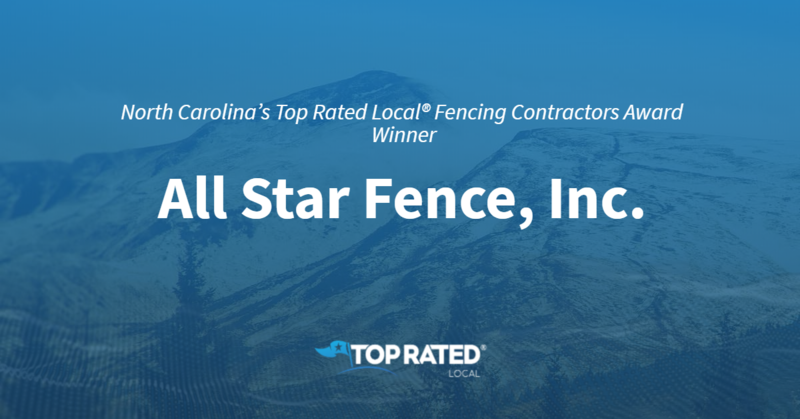 North Carolina’s Top Rated Local® Fencing Contractors Award Winner: All Star Fence, Inc.
Top Rated Local® is pleased to announce that All Star Fence, Inc. is an award winner for fencing contractors in 2019. 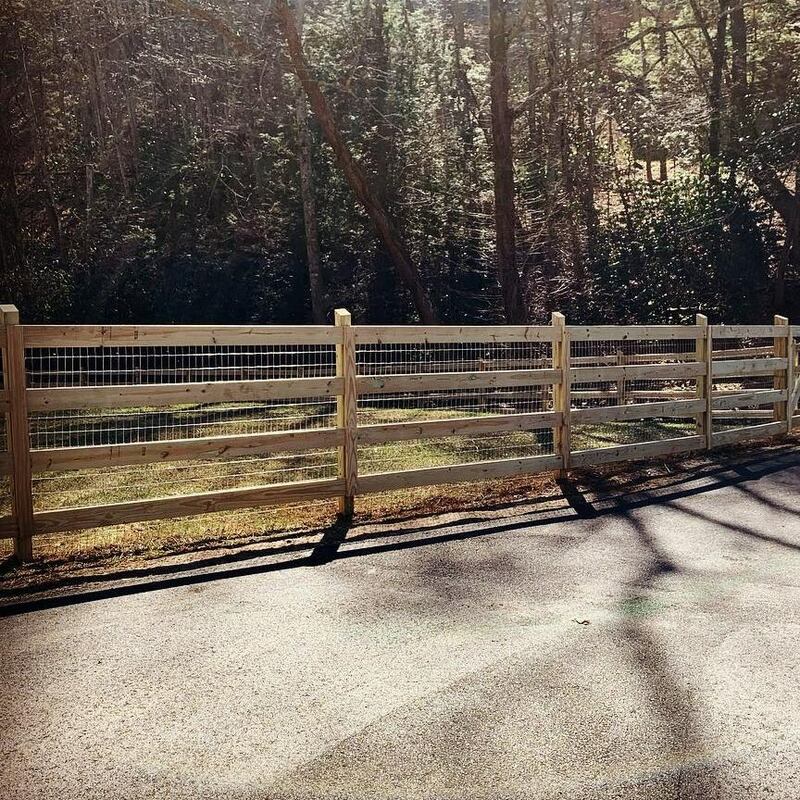 For all of your fencing needs in Asheville, look no further than this award-winning company! All Star Fence, Inc. has received many overwhelmingly positive reviews across four different verified sites with an average rating of 4.71 stars, earning them an impressive Rating Score™ of 95.11 and a 2019 Top Rated Local award for ranking as one of the top five fencing contractors in North Carolina! “All Star Fence did a fabulous job installing my aluminum fence! [They offered] great customer service, professional workmanship, and [were] very accommodating to my schedule. Thank you, Cody. The fence is beautiful!” – H.M. It is because of excellent reviews like this that All Star Fence, Inc. is now able to call themselves a Top Rated Local award winner! We were excited to learn all about how All Star Fence, Inc. has been able to build such an impressive reputation, so we sat down with the owner, Cody Grindstaff. The first thing we wanted to know was what it is that makes All Star Fence, Inc. stand apart from their competitors. Cody told us that the family has been in this business for over 50 years, so they are very knowledgeable in their work. Because of the strong foundation they have in this work, they are able to build trust and rapport with their clients, and are able to provide the best customer service possible. They also use all recycled metals! With as impressive a reputation as All Star Fence, Inc. has managed to build, we were excited to hear more about some of their marketing strategies. It came as no surprise that referrals were a main source of new business for them. They have found their customer reviews to be incredibly valuable. In addition to building on the trust and connections they have with their clients, they also work to build relationships with other local businesses, and will often network with contractors. Of course, they pair this grassroots style of marketing with staying on top of an active social media presence. Congratulations to All Star Fence, Inc. for being a 2019 Top Rated Local award winner, and special thanks to Cody for taking the time to speak with us! Top Rated Local® is pleased to announce that KWN Fence LLC is a 2019 award winner for fencing contractors in Minnesota! For all of your fencing needs in Inver Grove Heights, there’s no better option than KWN Fence LLC. KWN Fence LLC has received dozens of reviews with an average rating of 4.60 stars, earning them an outstanding Rating Score™ of 88.00 and a 2019 Top Rated Local award for ranking among the top 10 fencing contractors in all of Minnesota! “Alex and his co-worker did a wonderful job on both of our projects. It’s difficult to find someone who is willing to do jobs that are not real big and take a little extra effort to complete. They were both very friendly and helpful. They also did the work for a very reasonable price compared to the others who had quoted us first. Thanks again, Alex!” – Barbara L.
Alex Chacon, the owner of KWN Fence LLC, generously gave us a few minutes of his time to tell us about his award-winning business and its superb online reputation. Alex went on to tell us that he gets all of his materials at the same price as the much larger companies and has a smaller customer base, so his prices are competitive and his work his better quality. KWN Fence LLC is a family business; in fact “KWN” is an acronym for Alex’s wife and daughters. We also asked Alex what their mission is at KWN Fence LLC and how the work to make the world a better place. Alex shared with us that he worked for larger fencing contractors for years and gained knowledge and expertise in the fencing industry, which he uses to benefit his own customer base. He added that he wants to provide good fences at a reasonable cost. Alex attributes KWN Fence LLC’s strong online reputation to his and his team’s commitment to doing such good work that they are confident enough to ask for reviews from their happy customers. Outside of building a powerful online reputation, Alex has spread the word about KWN Fence LLC and what they do through Google ads, his Angie’s List profile and word of mouth. Congratulations to the team at KWN Fence LLC for being a 2019 Top Rated Local award winner, and thank you so much, Alex, for taking the time to speak with us! We highly recommend KWN Fence LLC in Inver Grove Heights. Visit their website today! Top Rated Local® is pleased to announce that Extraordinaire Fence Company, LLC is a 2019 award winner for fencing contractors in South Dakota! For all of your fencing needs in Sioux Falls, turn to the experts at Extraordinaire Fence Company. Extraordinaire Fence Company has received dozens of reviews on multiple verified sites with an average rating of 4.87 stars, earning them a stupendous Rating Score™ of 90.74 and a 2019 Top Rated Local award for being ranked the number one fencing contractor in all of South Dakota! “I’ve seen this company putting fencing up around our neighborhood, and I decided to see what the cost would be. It was one of the smartest moves I have made in a long time… This company does an amazing job and is very approachable with any fencing need you may have. They give a small-town feel in a city the size of Sioux Falls. They go the extra mile to make sure you are 100-percent satisfied with the end result. I give five stars easy for Extraordinaire!” – Travis M.
In order to learn a little more about this one-of-a-kind business and its impressive online reputation, we took a few minutes to talk with Jared Roach, the owner of Extraordinaire Fence Company. Jared went on to tell us that he makes it a point to personally be on-site for almost every single project. Outside of building a powerful online reputation, Jared hasn’t had to do much in the way of advertising to get the Extraordinaire Fence Company name out there. He was born and raised in the area, so people know him and his company. All of their fencing projects feature signs from start to finish, which is a really great form of free advertising. Congratulations to the team at Extraordinaire Fence Company, LLC for being a 2019 Top Rated Local award winner, and thank you so much, Jared, for taking the time to speak with us! 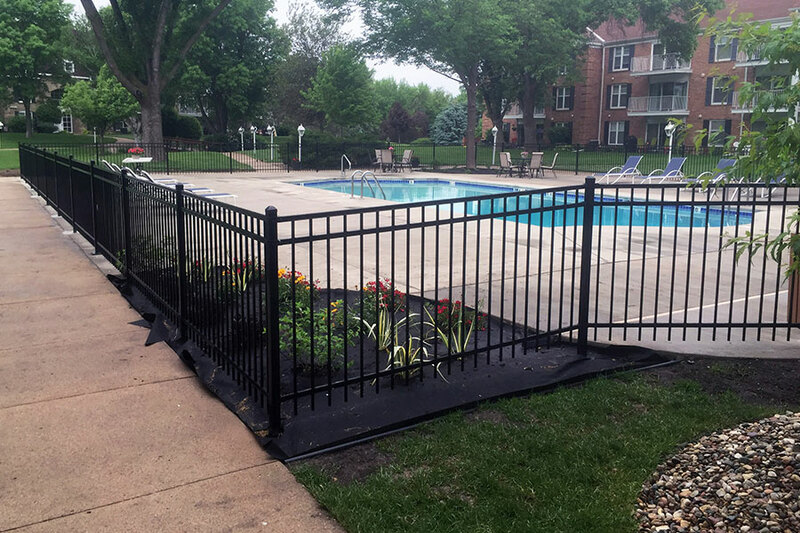 We highly recommend Extraordinaire Fence Company for all of your fencing needs in Sioux Falls. Visit their website today! Top Rated Local® is pleased to announce that American Fence Co is an award winner for fencing contractors in 2019! If you are looking for a fencing contractor that will provide quality products and excellent service, look no further than this award-winning company! American Fence Co has received many overwhelmingly positive reviews across multiple verified sites with an average rating of 4.74 stars, earning them an impressive Rating Score™ of 91.38 and a 2019 Top Rated Local award for ranking as one of the top 10 fencing contractors in Minnesota! 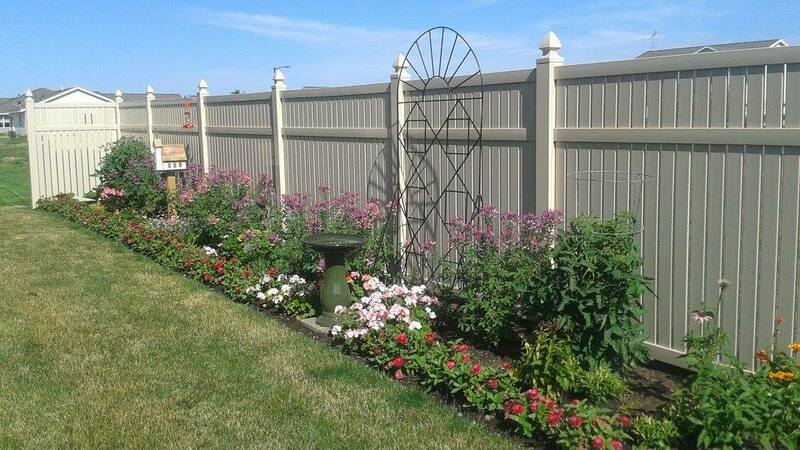 “[The] fence turned out fantastic, and they were so flexible with our rescheduling issues along the way. Once they began, they finished quicker than anticipated! [They] were great to work with. [I] would recommend [them].” – Ethan S.
It is because of excellent reviews like this that American Fence Co is now able to call themselves a Top Rated Local award winner! All of the positive reviews have certainly helped to establish American Fence Co.’s pristine reputation. It’s no surprise that word of mouth referrals have been their top source for new customers. Congratulations to American Fence Co for being a 2019 Top Rated Local award winner, and special thanks to Deanna for taking the time to speak with us! 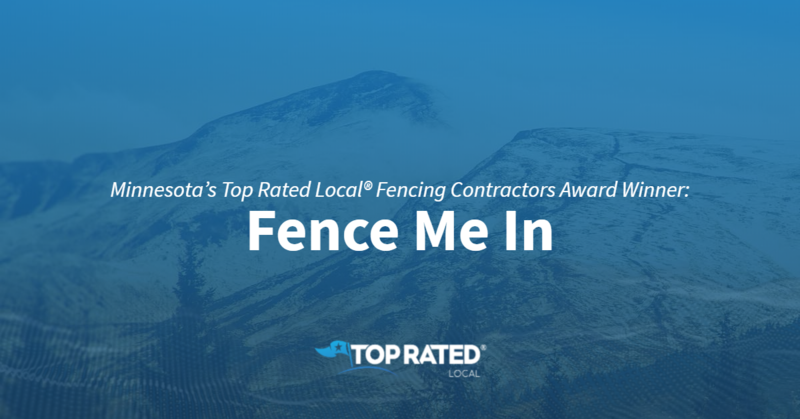 Top Rated Local® is pleased to announce that Fence Me In is a 2019 award winner for fencing contractors in Minnesota! Turn to a fencing contractor that will get the job done right the first time by turning to Fence Me In. Fence Me In has received dozens of reviews on three verified sites with an average rating of 4.60 stars, earning them a spectacular Rating Score™ of 92.04 and a 2019 Top Rated Local award for ranking among the top 10 fencing contractors in Minnesota! “I don’t normally leave reviews, but the experience I had with this company certainly warrants an exception. From the initial estimate to completion, this company has been amazing to work with. The communication has been the best, with quick responses and explanations. I received several other bids, and they came in at best, but that’s not the only reason I went with them. They were extremely understanding and worked with us as we were moving into a new home and wanted to get things done right away. But they stood apart when they accommodated us when we had some bumps in the road due to property lines, sprinklers, etc. When finally installed, the fence looks amazing and I know we will enjoy this quality fence for many years.” – V.R. Charlie Swanson, the owner of Fence Me In, generously gave us a few minutes of her time to tell us about his award-winning business and its fantastic online reputation. To kickstart our conversation with Charlie, we asked him what makes Fence Me In stand out from the crowd when compared to the many other fencing companies people could turn to in Minnesota. Charlie points to the fact that Fence Me In is a small business, and that they stand behind their warranty. He also shared with us that all of the products they use are American-made. Charlie attributes Fence Me In’s strong online reputation to their commitment to using high-quality materials, customer satisfaction, getting the job done right and being on time — which all boils down to providing great service. Outside of building a powerful online reputation, Fence Me In has gotten their name out there by running some Google ads, but most of their business comes from word of mouth. Congratulations to the team at Fence Me In for being a 2019 Top Rated Local award winner, and thank you so much, Charlie, for taking the time to speak with us! For all of your fencing needs, we highly recommend Fence Me In. Visit their website today! 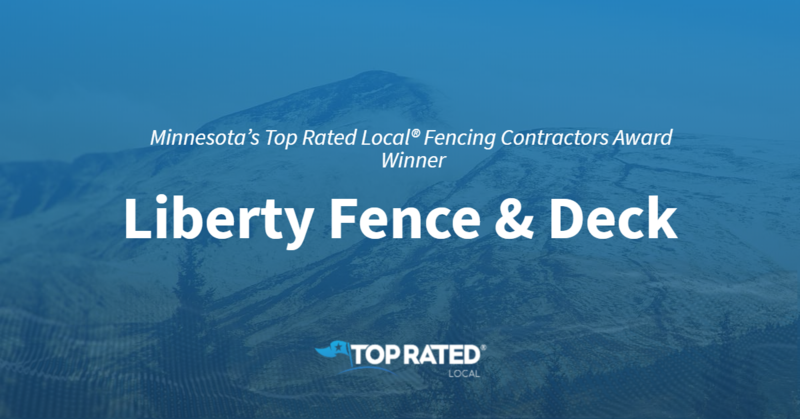 Minnesota’s Top Rated Local® Fencing Contractors Award Winner: Liberty Fence & Deck Co.
Top Rated Local® is pleased to announce that Liberty Fence & Deck Co. is an award winner for fencing contractors in 2019. Liberty Fence & Deck Co. brings years of experience, quality materials, and a focus on customer service. Give them a call for any of your fencing needs! Liberty Fence & Deck Co. has received many overwhelmingly positive reviews across a number of verified sites with an average rating of 4.69 stars, earning them an impressive Rating Score™ of 90.85 and a 2019 Top Rated Local award for ranking as one of the top 10 fencing contractors in Minnesota! “[I was] very impressed with the work from Liberty on fixing our cedar fence. Everything from customer service, scheduling, the estimator who came out, and the installers/finishing crew were top notch, even though the work we needed to be done was small. After attempting to work with other fence companies in the F/M area, I am glad we went with Liberty and would gladly work with Liberty again. Other fence companies should take notice.” – J.S. It is because of excellent reviews like this that Liberty Fence & Deck Co. is now able to call themselves a Top Rated Local award winner! We were excited to learn all about how Liberty Fence & Deck Co. has been able to build such an impressive reputation, so we sat down with the owner Jeff Peters. The first thing we wanted to know was what it is that makes Liberty Fence & Deck Co. stand apart from their local competitors. “[They offered] professional installation, competitive pricing, and awesome customer service. I highly recommend Liberty Fence and Deck to anyone looking for quality fences at the best price.” – M.K. Congratulations to Liberty Fence & Deck Co. for being a 2019 Top Rated Local award winner, and special thanks to Jeff for taking the time to speak with us! Top Rated Local® is pleased to announce that Authority Fence & Deck is an award winner for fencing contractors in 2019. Look no further than Authority Fence & Deck for all of your central Minnesota fencing, railing, and deck needs. Authority Fence & Deck has received many overwhelmingly positive reviews across three different verified sites with an average rating of 4.66 stars, earning them an impressive Rating Score™ of 88.91 and a 2019 Top Rated Local award for ranking as one of the top ten fencing contractors in Minnesota! “I had multiple offers on my chain link fence, they were very competitive in price. The reason I went with them is because of how caring they were on the phone. You could tell that they really cared about their work and the product that they offer. All the other companies seemed to not really care. I am so happy with the work that they did; it is of high quality and the workers were some of the nicest people. If I ever need another fence or deck at a different home in the future I will be calling them right away. Thanks Again!” – T.S. It is because of excellent reviews like this that Authority Fence & Deck is now able to call themselves a Top Rated Local award winner! We were excited to learn all about how Authority Fence & Deck has been able to build such an impressive reputation, so we sat down with the co-owner, Scott Sytnieski. The first thing we wanted to know was what it is that makes Authority Fence & Deck stand apart from their local competitors. Scott told us that theirs is one of the few companies that has a showroom so clients can see exactly what they’ll be purchasing. Scott also shared that Authority Fence & Deck has many long-term employees, so you know you’re getting not only quality but also expertise. Authority Fence & Deck is a family business, and, together with his wife, Joanne, and their son, Jared, this family works hard towards their mission of doing the best work they can to the best of their abilities. Customer service is the highest priority to Scott and the rest of the Authority Fence & Deck family. Scott says that their location itself is a large source of advertising for Authority Fence & Deck. With 500 feet of land along the highway, people can’t help but see Authority Fence & Deck. Even with their prime location, Scott says that word of mouth referrals bring them about half of their new clients. They are also very active in the community, serving on the Monticello Chamber of Commerce, singing in church choirs, and being the lead singer of a local Christian rock band. Authority Fence & Deck also worked together with the Monticello community to install a new fence around the cemetery. Scott says that it is also important for him to serve those in hardship. Congratulations to Authority Fence & Deck for being a 2019 Top Rated Local award winner, and special thanks to Scott for taking the time to speak with us! 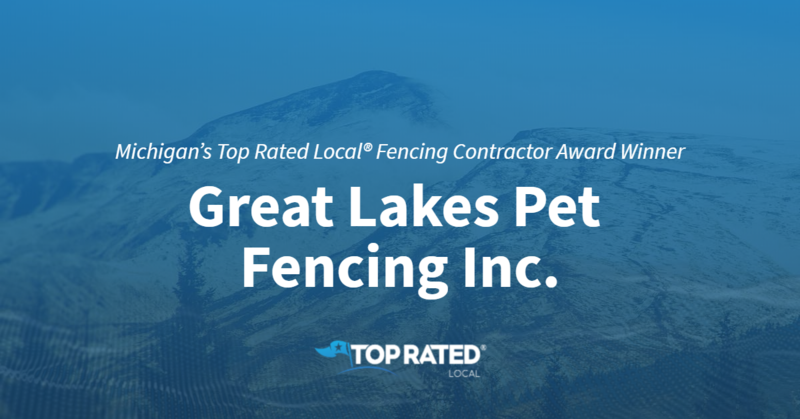 Michigan’s Top Rated Local® Fencing Contractor Award Winner: Great Lakes Pet Fencing Inc.
Top Rated Local® is pleased to announce that Great Lakes Pet Fencing is a 2019 award winner! “This company was wonderful. [They provided} great service, [were] very knowledgeable, and the fence has worked great! I have a young beagle and was very skeptical about how this would work for him, and I have to say, I am very impressed with the results. It has allowed me to let him outside without fear of him running. I would highly recommend Great Lakes Pet Fencing to anyone considering electric fencing. The professionalism and compassion this team showed was wonderful. [They] even called after to make sure we were satisfied. Overall, [this is a] great company!” -Jamie C.
Joe Rangel, who owns Great Lakes Pet Fencing with his wife, Lisa, took some time to chat with our team about their business’ success both online and overall. Joe also mentioned that he would like to thank his wife and business partner Lisa, for all of her hard work. Congratulations to the team at Great Lakes Pet Fencing Inc. for being a 2019 Top Rated Local award winner, and thank you so much, Joe and Lisa, for taking the time to speak with us! 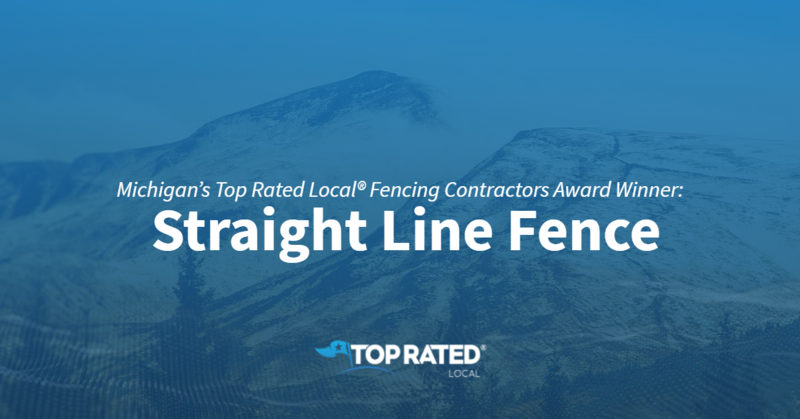 Top Rated Local® is pleased to announce that Straight Line Fence is a 2019 award winner for fencing contractors in Michigan! For all of your fencing needs in Grand Rapids, work with the experts at Straight Line Fence. Straight Line Fence has received dozens of reviews on five verified sites with an average rating of 4.73 stars, earning them an outstanding Rating Score™ 97.31 and a 2019 Top Rated Local award for being ranked the number one fencing contractors in all of Michigan! “[I am] so very happy with every aspect, from our first initial contact to the fence installation and everything in between. This company is amazing to work with, and the job they do is top notch! We will never use anyone else but them again.” – Arline W.
Matt Fortuna, who co-owns Straight Line Fence with Joel Vergouwe, gave us a few minutes of his time to tell us a little more about his business and the impressive reputation they’ve managed to build. The first question we had for Matt was what sets Straight Line Fence apart from the many other fencing contractors in Michigan. He points to their commitment to their customers and to the fact that they stand behind everything they do. He also told us that his very strong staff is a big part of the business. Matt credits Straight Line Fence’s strong online reputation to the good service they provide and to the fact that they ask customers for reviews. Outside of building a powerful online reputation, Straight Line Fence has gotten their name out there through some Google ads, a trade show and sports radio. Congratulations to the team at Straight Line Fence for being a 2019 Top Rated Local award winner, and thank you so much, Matt, for taking the time to speak with us! We highly recommend working with Straight Line Fence for all of your fencing needs in Grand Rapids. Visit their website today! 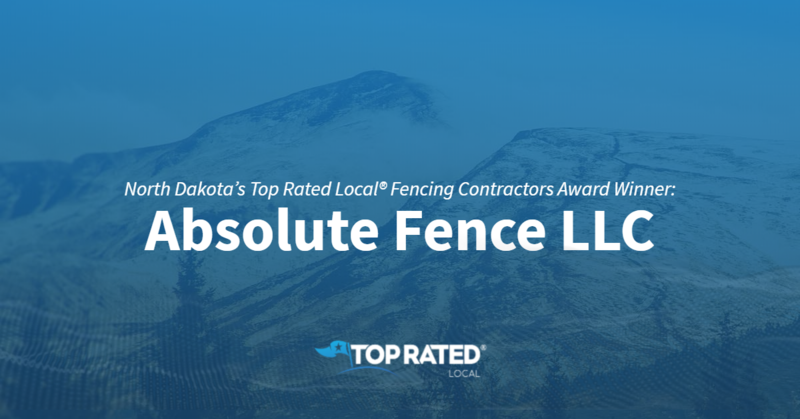 Top Rated Local® is pleased to announce that Absolute Fence LLC is a 2019 award winner for fencing contractors in North Dakota! When it comes to residential and commercial fencing in West Fargo, no other company beats Absolute Fence LLC. Absolute Fence LLC has received dozens of reviews on three verified sites with an average rating of 4.74 stars, earning them an incredible Rating Score™ of 93.43 and a 2019 Top Rated Local award for being ranked the number one fencing contractor in all of North Dakota! “[They were] fast and friendly! They showed up in a snowstorm to finish my fence because they knew my dogs were cooped up. [They provided] professional service from start to finish; I couldn’t be happier with the quality or the price. Thanks.” – Mason P.
We wanted to learn a little more about Absolute Fence LLC and their enviable online reputation, so we sat down with the owner, Scott Backen. The first question we had for Scott was what sets Absolute Fence LLC apart from the many other fencing contractors in North Dakota. He points to their experience and the quality of the materials they use. When asked about his secret to Absolute Fence‘s strong online reputation, Scott credits his commitment to asking his clients for reviews. Outside of building a powerful online reputation, word of mouth has been the main source of growth at Absolute Fence, which speaks to their quality service and professionalism. Congratulations to the team at Absolute Fence LLC for being a 2019 Top Rated Local award winner, and thank you so much, Scott, for taking the time to speak with us! For all of your fencing needs in West Fargo, we highly recommend working with Scott and his team at Absolute Fence LLC. Visit their website today!